The UK government supports custom building and wants to retain current schemes and provide a mechanism for mutual recognition between Member States where technical standards are comparable. The benefits of anti-tampering are not clear (….) The UK Government (therefore) opposes new blanket anti tampering measures. The UK Government briefing by the UK Minister responsible: Mike Penning, Parliamentary Under Secretary of State, Department for Transport comments on the proposed amendments 95 to 304. At present the IMCO rapporteur and the shadow rapporteurs are discussing the amendments to reach a coherent set of compromise proposals which will then be voted on at IMCO meeting presently scheduled for the 17th October. We would assume that some of the amendments would not reach this vote (for example, the French MEP Robert Rochefort has already withdrawn two of his amendments – 97 and 103). This is, according to Malcolm Harbour, “to ensure better alignment with progress made on the dossier by the Council of Ministers (The Council of the European Union. )” The Council of the European Union is the EU institution where the Member States’ government representatives sit. 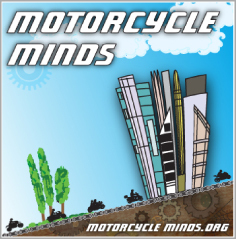 In respect of the motorcycle proposals we are facing, “It adopts legislative acts (Regulations, Directives, etc. ), in many cases in “co-decision” with the European Parliament”. This may all seem to be “Euro speak” as the proposal heads through the complexities of the European Co-decision process, a first reading, in the European Parliament in December, with an expected adoption by the European Parliament expected in December. Thus the UK Government comments on the IMCO amendments. This is supported by the Department for Transport (DfT) consultation to help refine the UK’s impact assessment on the Commission’s proposal. The response from the consultation is more likely to allow our government to take any additional evidence into account during the negotiating stage in the European process. At this point in time, whether we agree or not, this is what we have got, this is what we have to deal with and the sooner riders and riders organisations across the rest of Europe get to their MEPs and Governments in this EU legislative process the better, rather than sit in limbo hoping that the UK Government is top of the pile as it amends the worst of the proposal. It seems to us that the only riders getting upset about the EU proposals are the British and Irish (the French are angry with their own government about other issues such as Hi Viz and bans on 7 year old vehicles in cities, but don’t appear to have anything to say about these proposals). Our question: What is the rest of Europe – governments and riders – doing? • Individual Vehicle Approval (IVA) provides a route to national registration for individuals who build their own vehicles or import them from outside the EU. Including it within the scope of the Regulation is likely to bring more stringency and complexity to existing national schemes therefore IVA should remain out of scope of the Regulation. If IVA is to be retained within scope the regulation should permit Member States to retain current schemes and provide a mechanism for mutual recognition between Member States where technical standards are comparable. • The scope of this regulation should not be extended to vehicles primarily intended for off-road use. In the UK’s view this would not prevent manufacturers who wish to do so from approving off-road vehicles to the regulation provided they have features intended for safe use on the road. • The proposal makes provisions for anti-tampering measures on all vehicles within the scope leaving the technical detail to be developed by the Commission. The benefits of anti-tampering are not clear. Safety may be compromised should the power of the vehicle be increased beyond the capabilities of the safety systems, such as brakes and tyres and some modifications can increase emissions, but this is not sufficient justification for a blanket measure which might prohibit those wishing to modify a vehicle safely from doing so. • There might be some justification where vehicle performance is intentionally restricted, e.g. quad bikes or vehicles intended for learner riders, we are not aware of evidence that anti tampering offers benefits for larger capacity machines. The UK Government therefore opposes new blanket anti tampering measures. • Before any new functional safety measures are introduced the cost benefits need to be considered, the use of Delegated acts to introduce new measures might not be appropriate in all cases, and we would therefore recommend that new substantive functional safety measures are considered through the ordinary legislative procedure. • Advanced braking systems have the potential to significantly improve safety however fitting ABS to lower value vehicles is unlikely to be cost effective and CBS or other options should be allowed in these cases. Alternative forms of advanced braking should be permitted only where it can be demonstrated that they offer equivalent benefits. 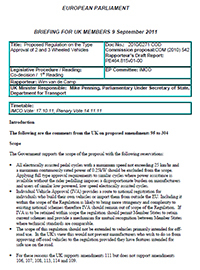 The proposed introduction date of 2017 is necessary to give vehicle manufacturers sufficient lead time to develop and implement these requirements across all their model ranges. • Individual Vehicle Approval (IVA) provides a route to national registration for individuals who build their own vehicles or import them from outside the EU. Including it within the scope of the Regulation is likely to bring more stringency and complexity to existing national schemes therefore IVA should remain out of scope of the Regulation. If IVA is retained within scope it should permit Member States to retain current schemes and provide a mechanism for mutual recognition where technical standards are comparable. • The Commission’s proposal introduces three successive stages of exhaust air pollutant emissions limits, tightening existing requirements. These would become mandatory for all new vehicles in 2015, 2018 and 2021. 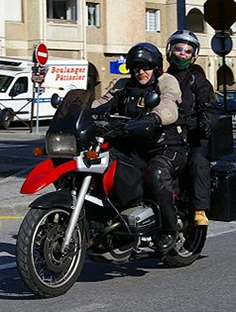 The Commission’s Impact Assessment argues that these measures are necessary in view of the fact that that motorcycles and mopeds represent a disproportionate share of transport Hydrocarbon (HC) and Carbon Monoxide (CO) emissions, but does not provide a cost-benefit justification or justify their significance for meeting EU air quality objectives. • The Commission propose the introduction of On Board Diagnostic (OBD) systems to monitor the correct functioning of emissions control systems. Two stages are proposed. Stage I requires the OBD system to check for circuit continuity of electrical components in the emissions control system and that signals from sensors are within the expected range (“rationality”). This has minimal cost and should help in detecting some emissions control failures. Since circuit continuity and rationality failures do not correlate with particular increases in emissions, OBD Threshold Limits (emissions levels at which OBD should indicate a fault) do not make sense in the context of OBD-I. • Stage II requires the performance of components of the emissions control system to be monitored for degradation. This will require additional sensors, and there is uncertainty regarding the technical feasibility of some of these sensors. The Commission’s Impact Assessment did not justify these standard in cost benefit terms. The UK Impact Assessment estimated the costs of OBD-II to be around 9 times the benefits. • In view of this the Government supports the adoption of OBD stage I only. • Non-discriminatory access to repair and maintenance information is essential for a competitive market for vehicle servicing and repair. The Government strongly supports this element of the Commission’s proposal as it delivers substantial net benefits to small and medium sized enterprises in the repair sector and to consumers through reduced servicing costs. • However, some amendments to the Commission’s text are necessary to clarify that vehicle manufacturers need not and should not be required to release intellectual property and that repair information should include bulk information on the components fitted to vehicles. Finally the obligation to provide all repair information in real time via website would be disproportionate on small series manufacturers who should be exempt from these obligations, as they are in the car sector.